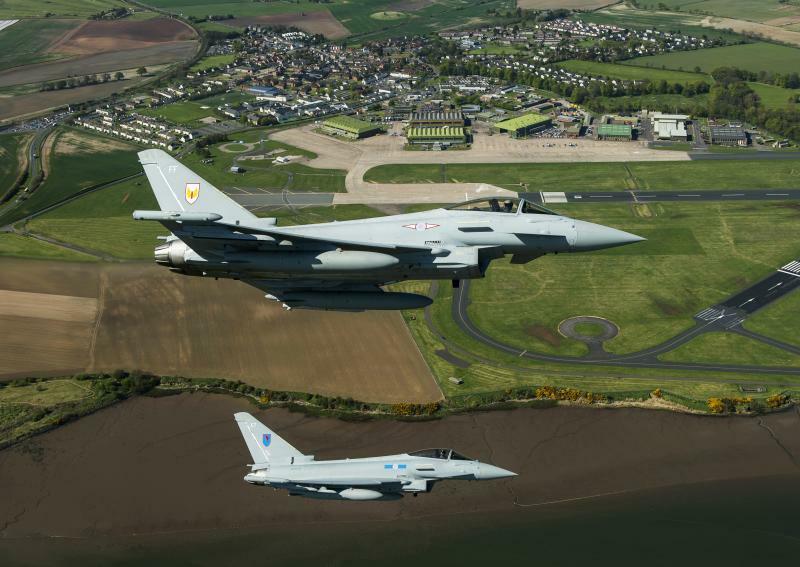 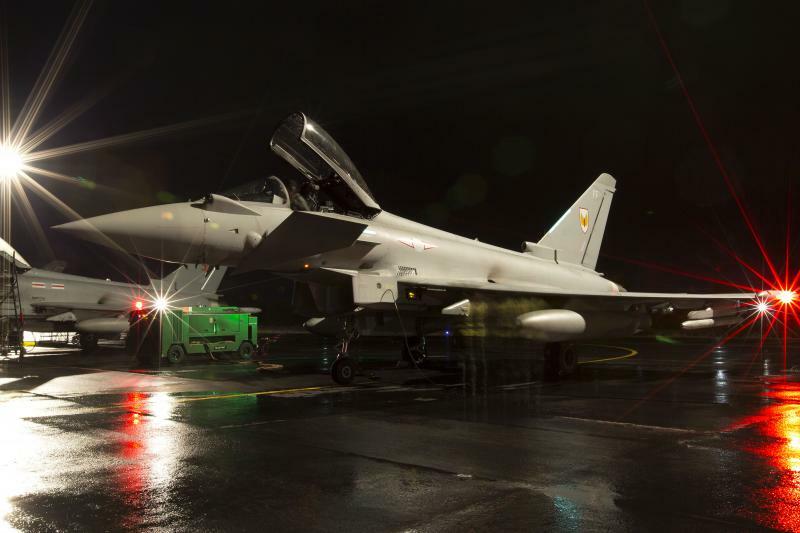 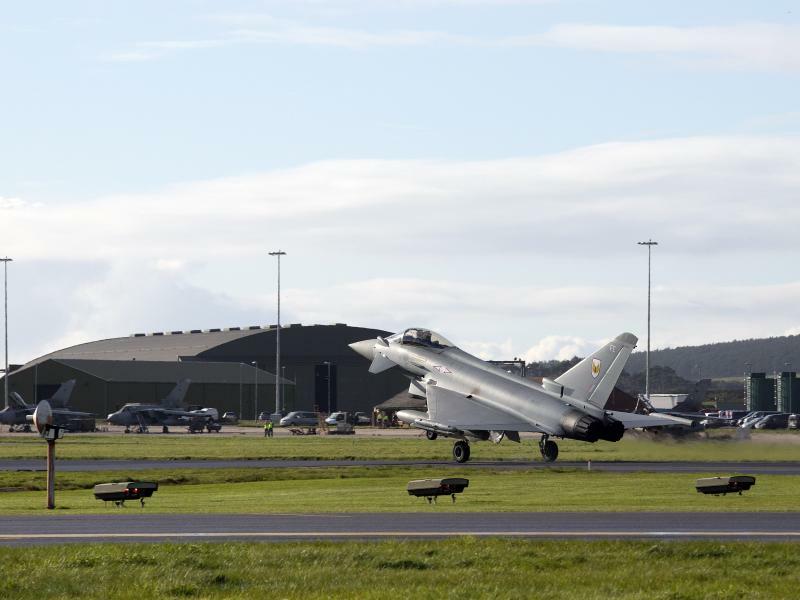 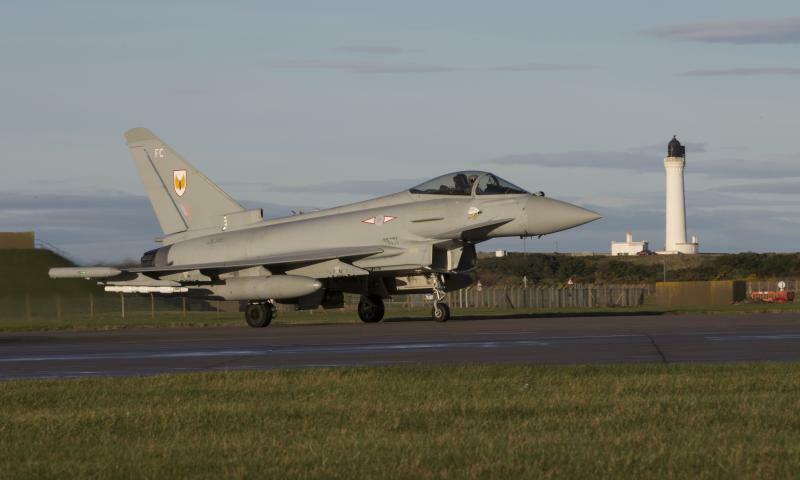 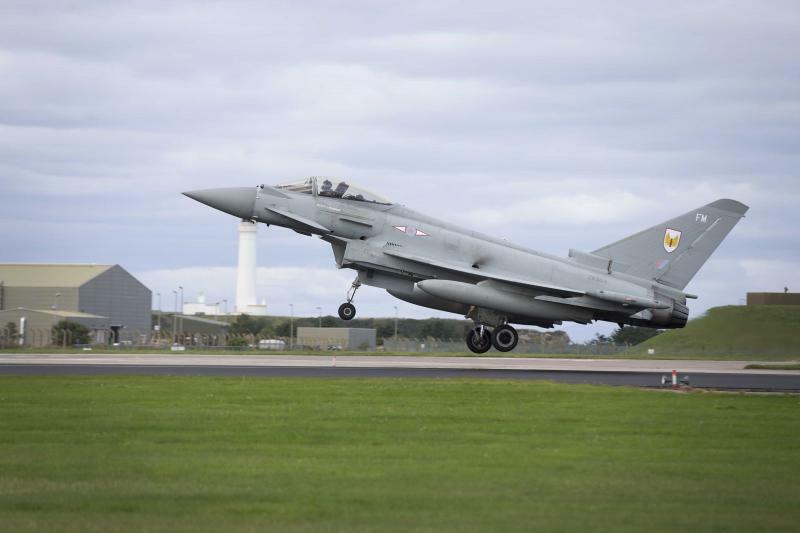 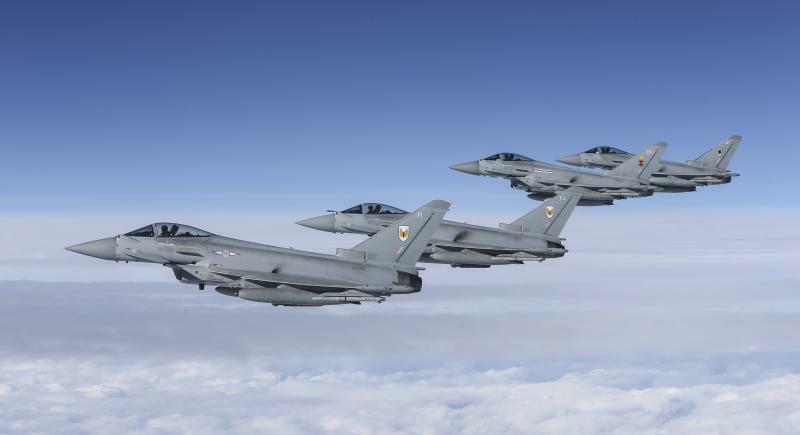 It was a damp and windy morning at RAF Lossiemouth on 5th January 2015 as Typhoons from 1(F) Squadron started their engines and cruised south to meet up with Voyager air to air refuelling aircraft from RAF Brize Norton holding over the south coast. 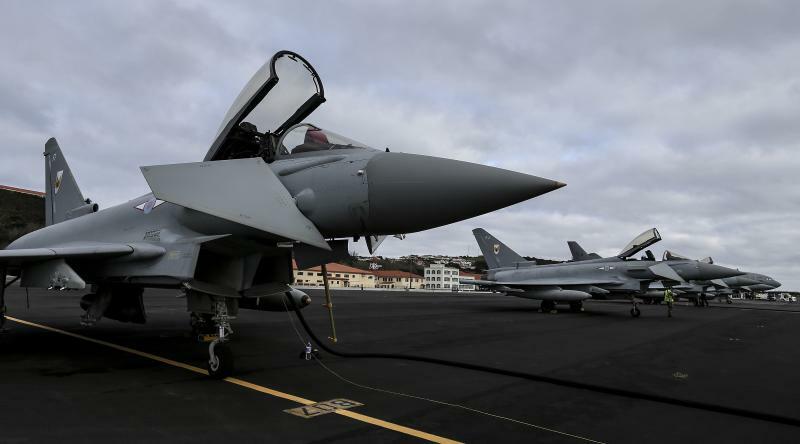 A few hours later the first four-ship was landing at Lajes, Azores, and the trail to the US for Ex RED FLAG was underway. 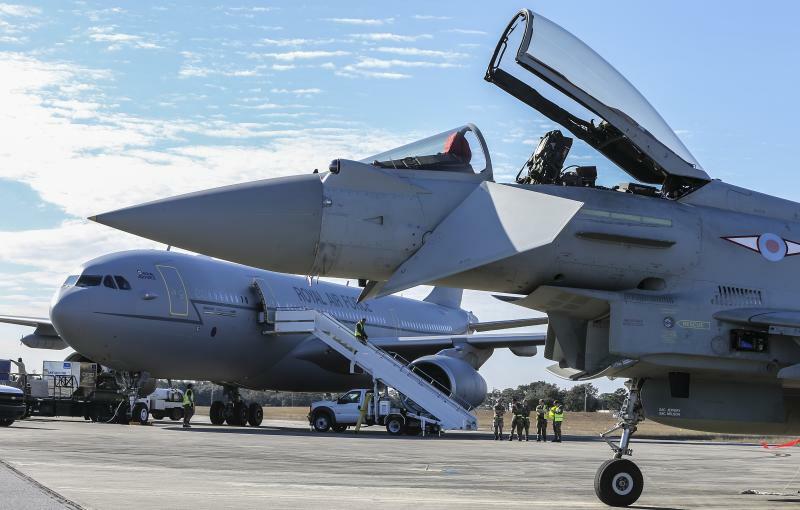 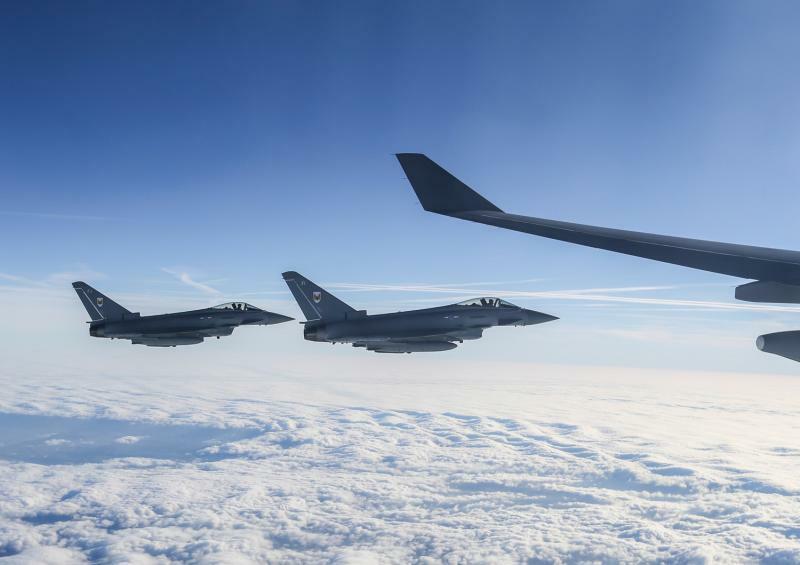 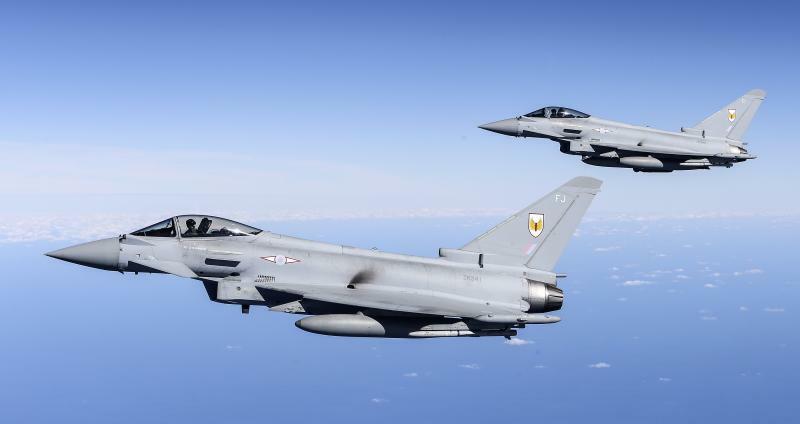 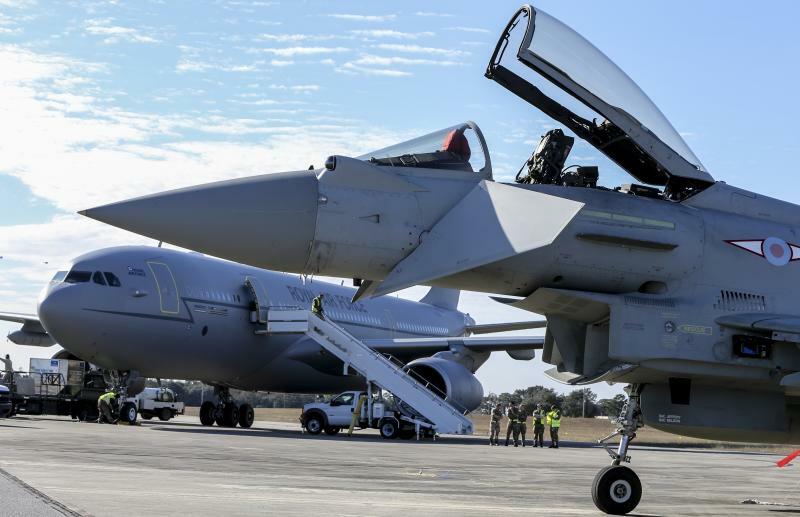 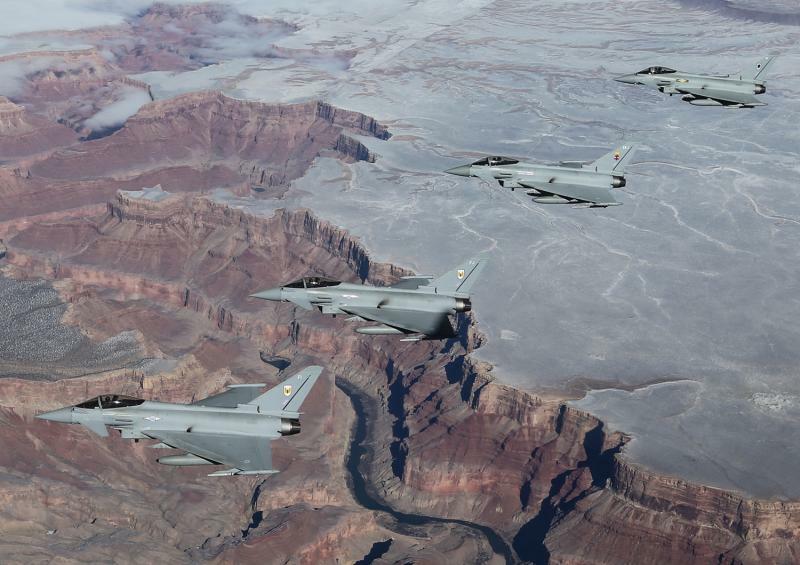 Over the next few days the formation stopped overnight at Bermuda, then Eglin AFB, before making its way across the States to arrive at Nellis on time for the start of the most challenging Air Exercise in the world. 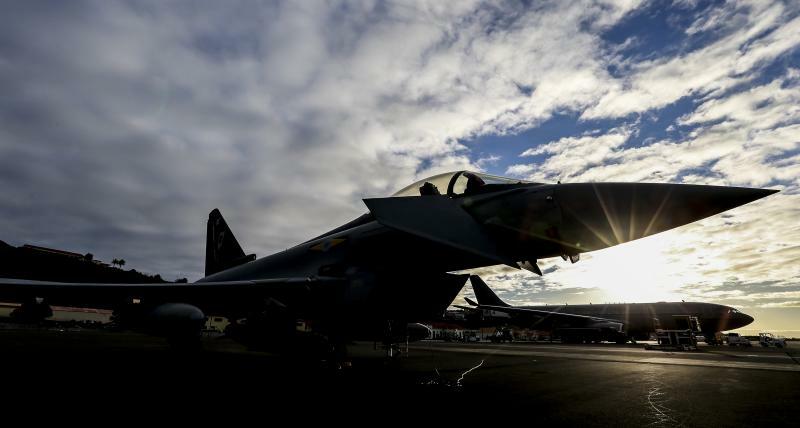 23 pilots, 130 engineers and support staff, and 8 Typhoons would be on display in front of several thousand members of the United States and Australian Air Forces: combat air, intelligence, surveillance and reconnaissance, combat search and recovery and unmanned air vehicles would all play a part in what was to come. 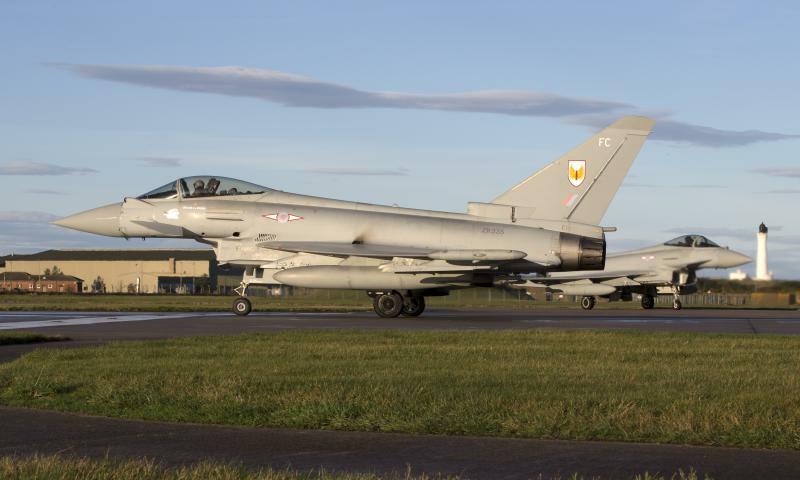 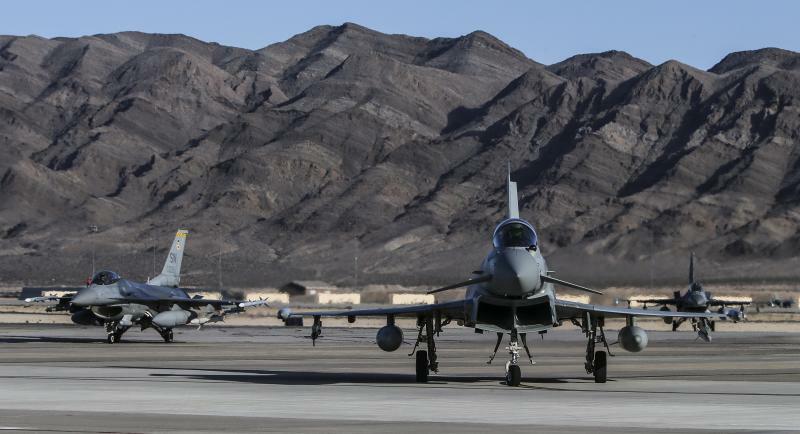 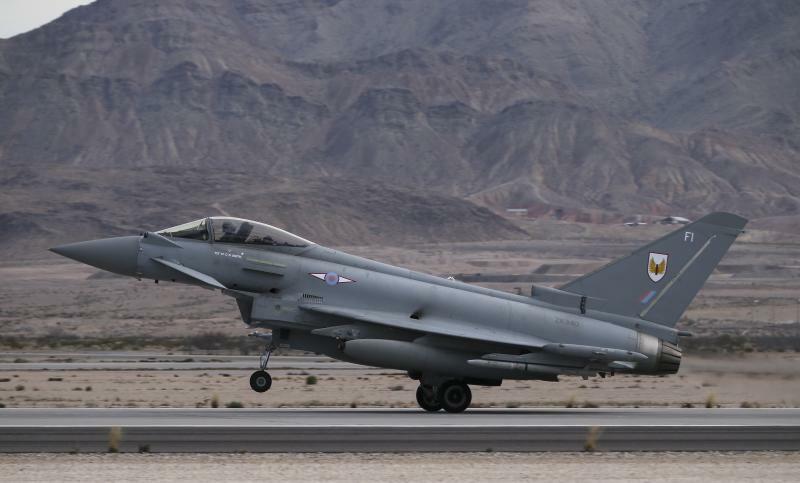 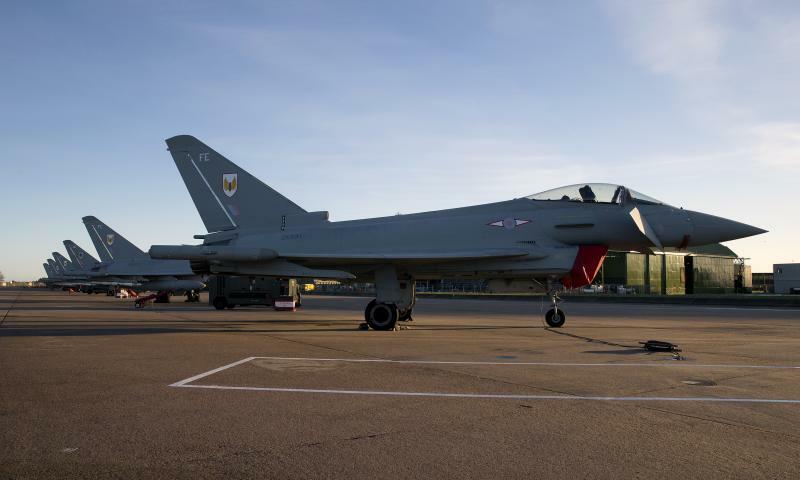 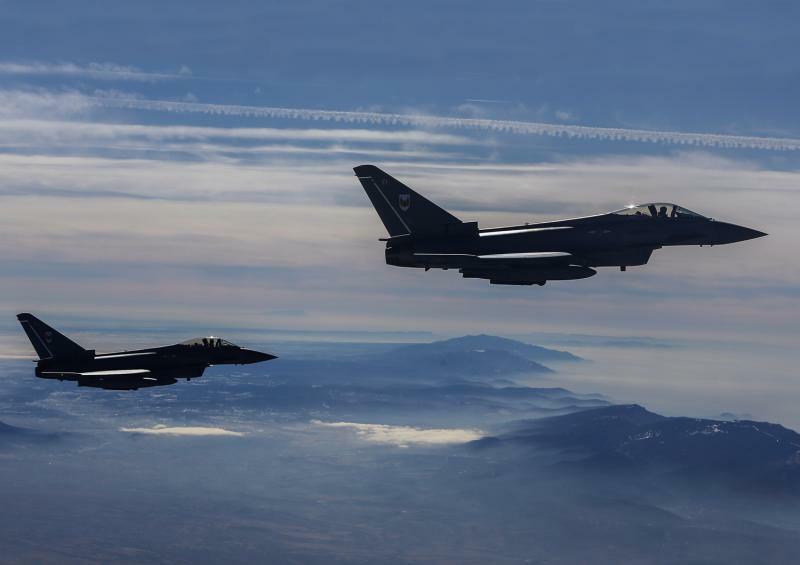 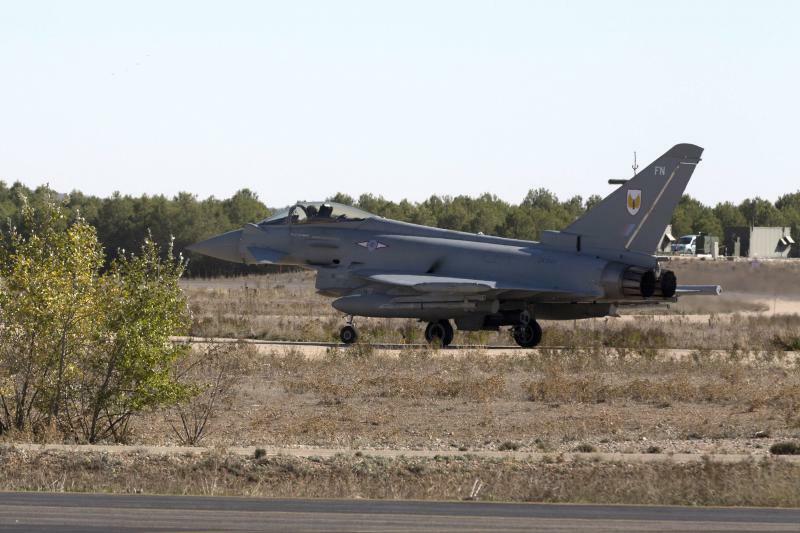 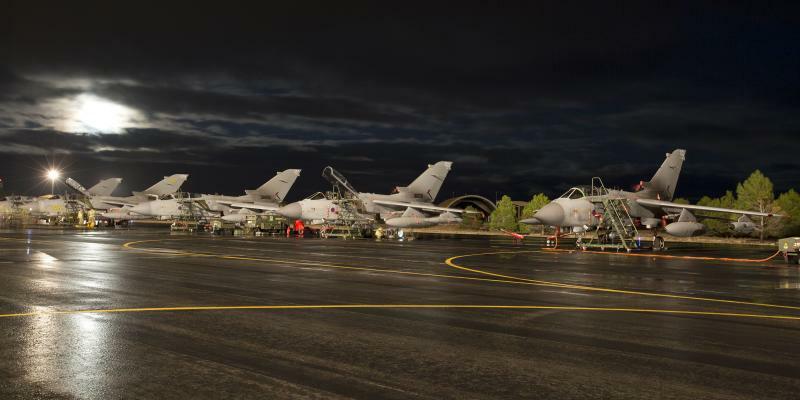 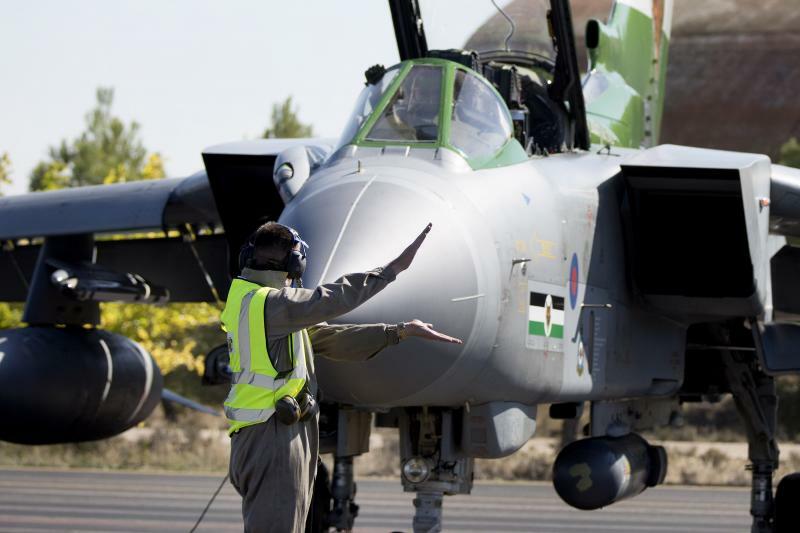 RED FLAG would put 1(F) Squadron through its paces as a swing-role unit against potent simulated air and surface threats. 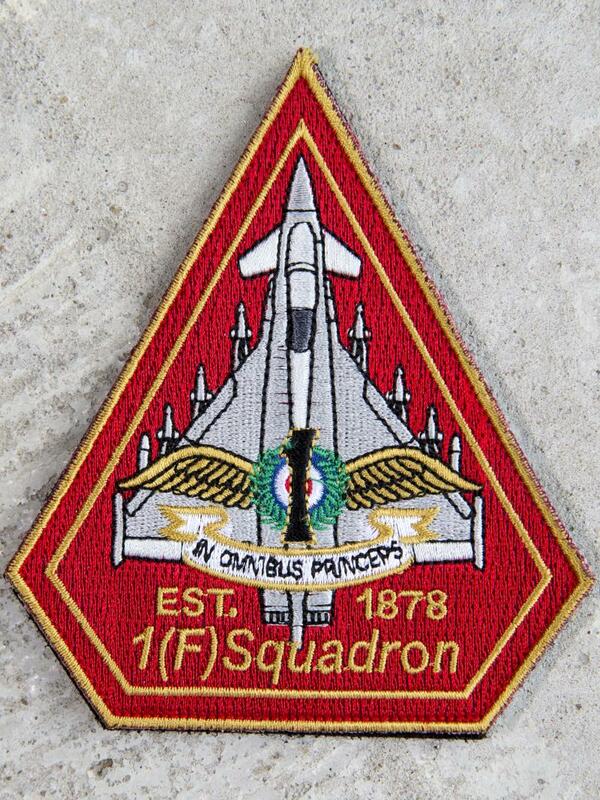 For months before the Sqn had been conducting a carefully managing training plan to ensure that the pilots were well versed in the multitude of skill sets that would be required: Air Interdiction, Air Combat, Defensive and Offensive Counter Air, and threat defence. 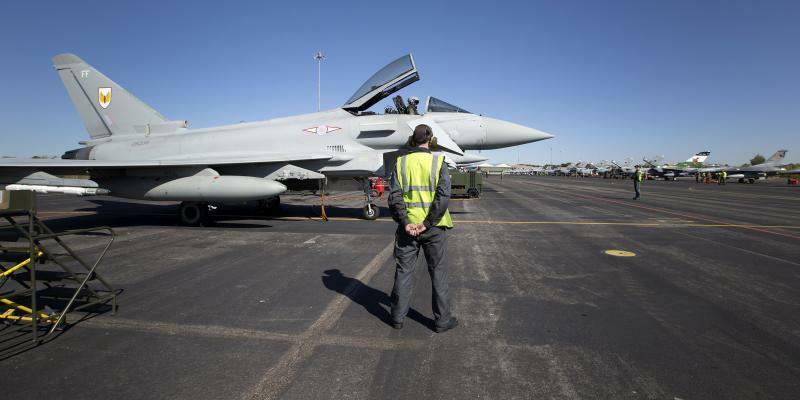 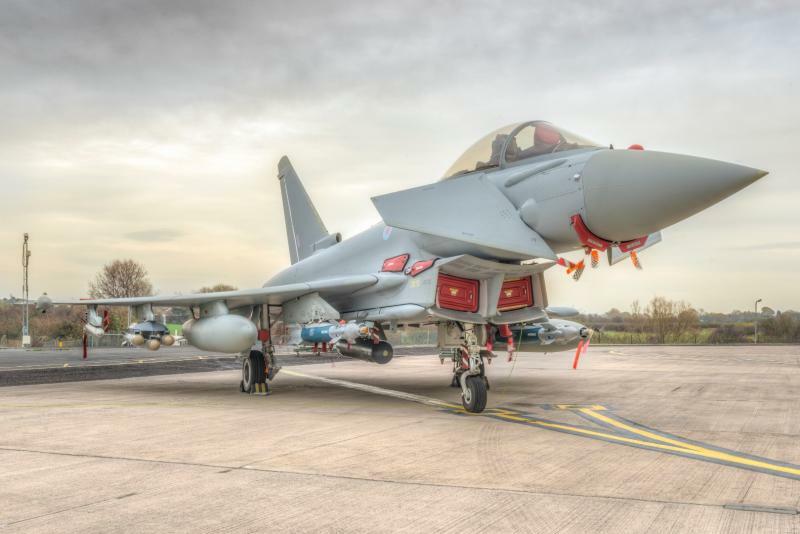 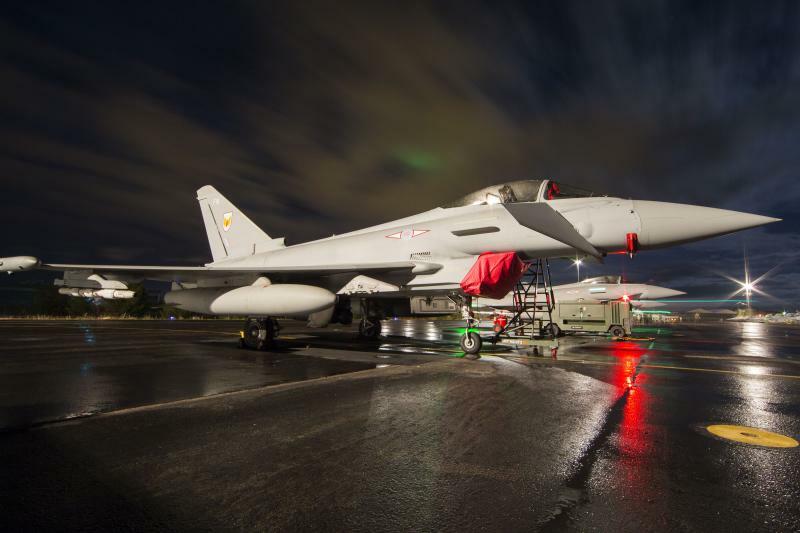 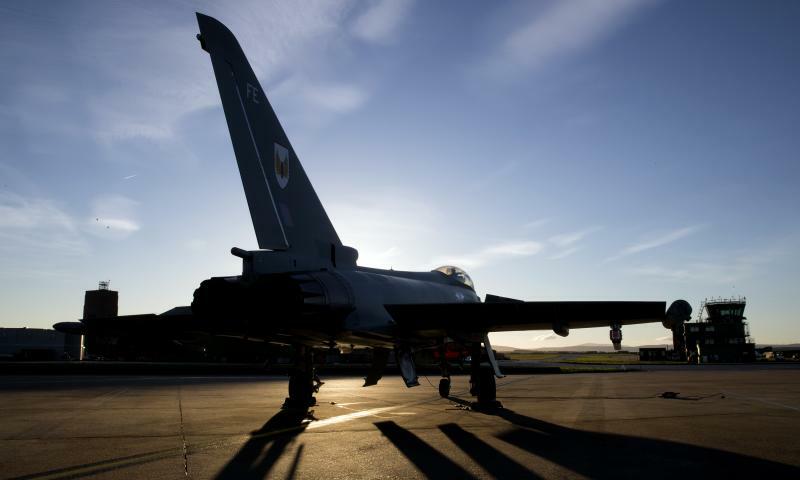 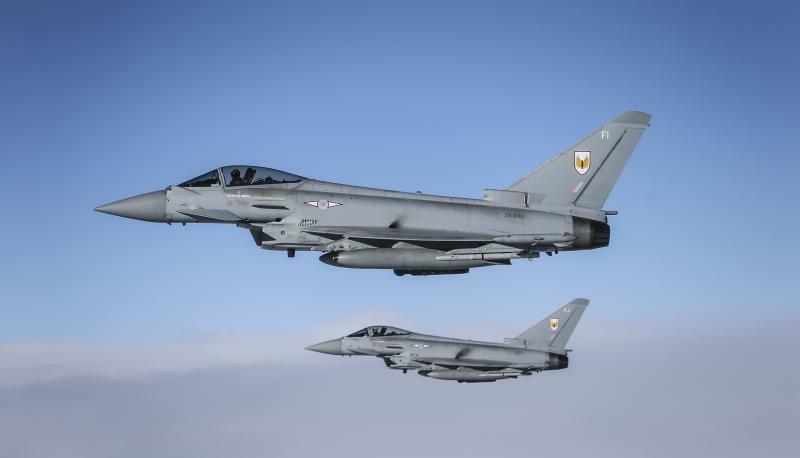 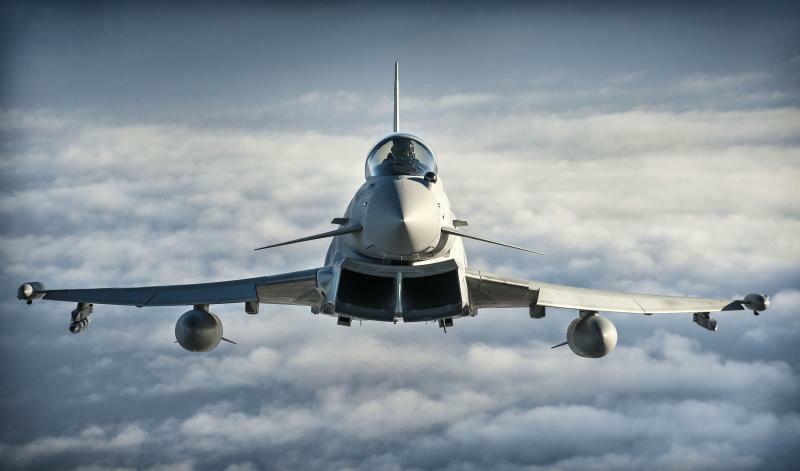 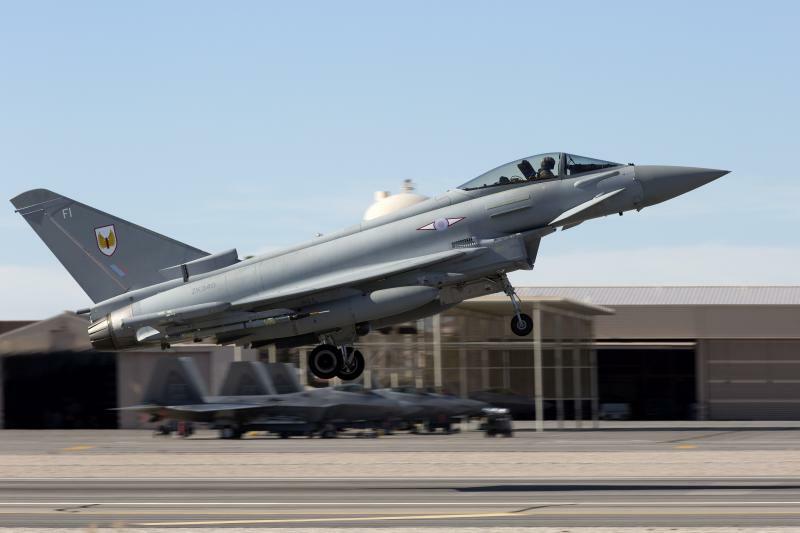 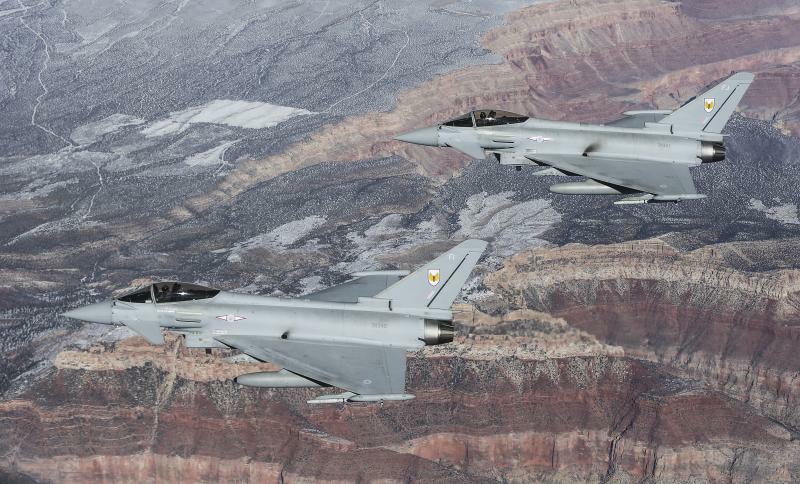 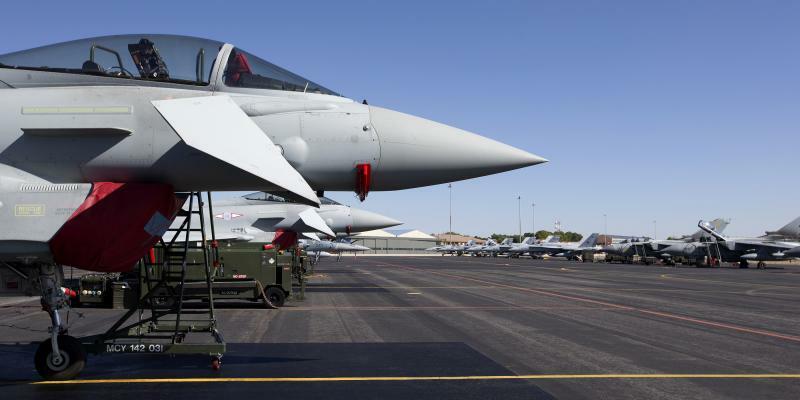 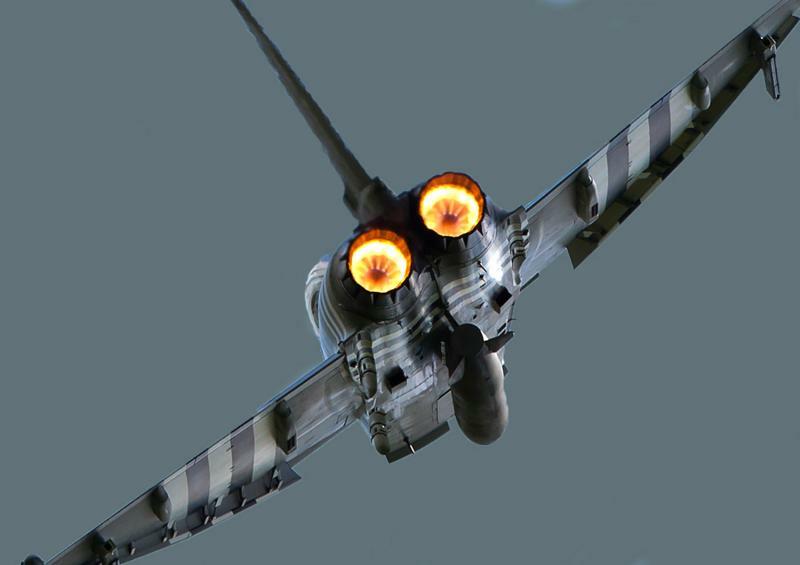 Simultaneously the Squadron had led the introduction of Phase One Enhancement B (P1Eb) to the frontline, which was a major capability upgrade to the Typhoon which gave it a true swing-role capability, and with it the ability to employ the precision Paveway IV weapon. 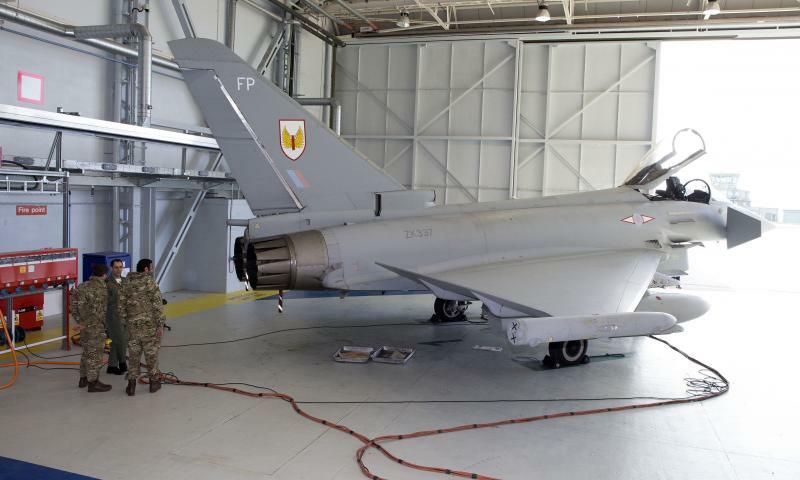 The aircraft could now switch between the air to air role and air to surface role at the flick of a switch. 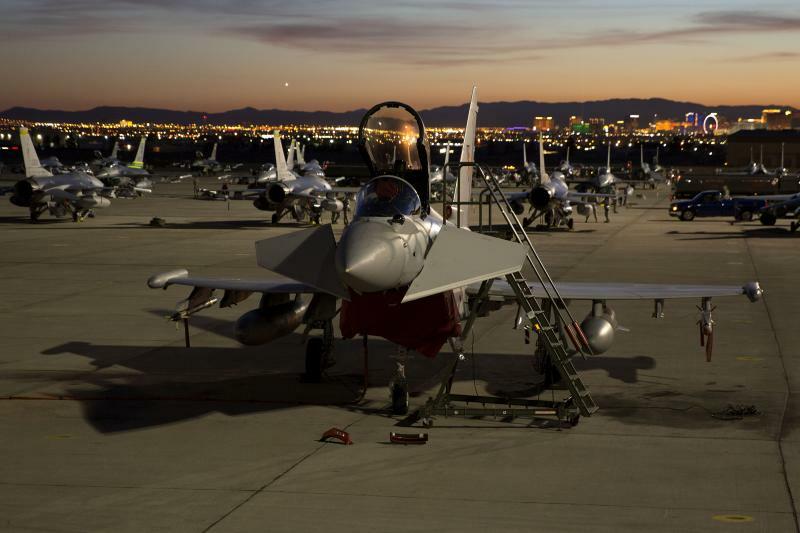 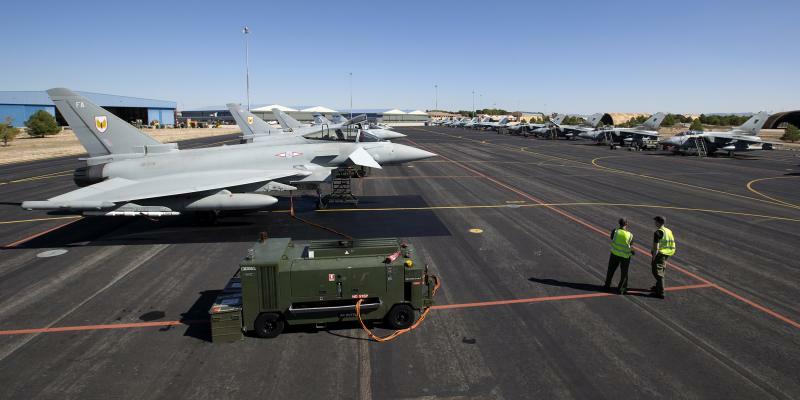 Once at Nellis Air Force Base and before the start of the Exercise, a week of flying with the local units was conducted. 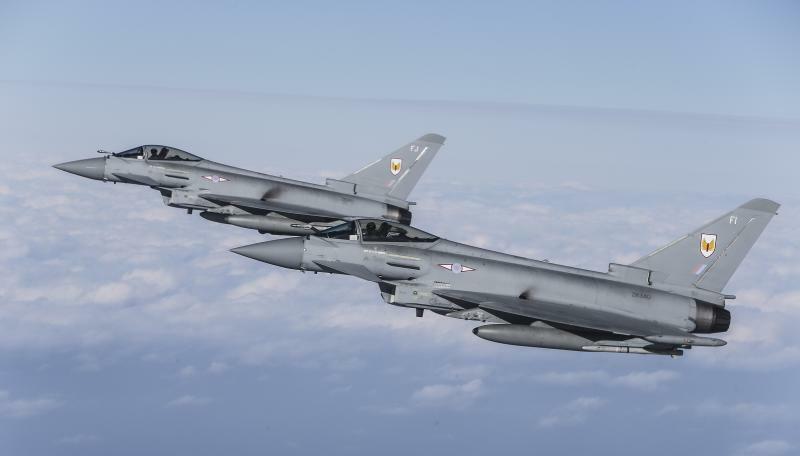 This included Time Sensitive Targetting and Suppression of Enemy Air Defences with the F16s, Close Air Support with the A10s and JTAC School, and Air Combat with the F22 RAPTORs. 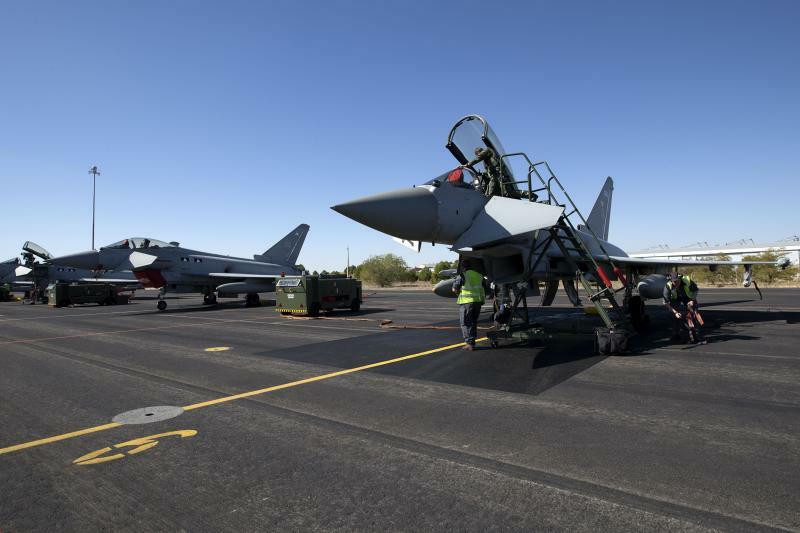 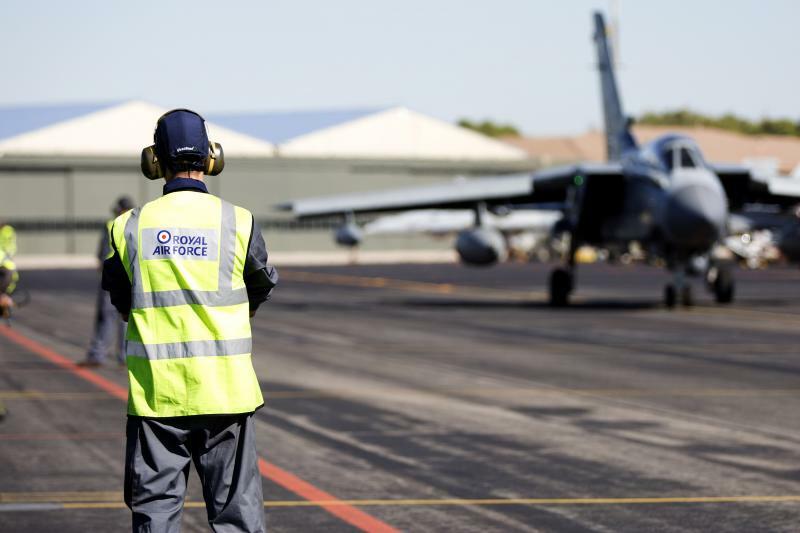 It was the ideal proving ground as all personnel familiarised themselves with the local procedures, and enjoyed the warm temperatures in the process. 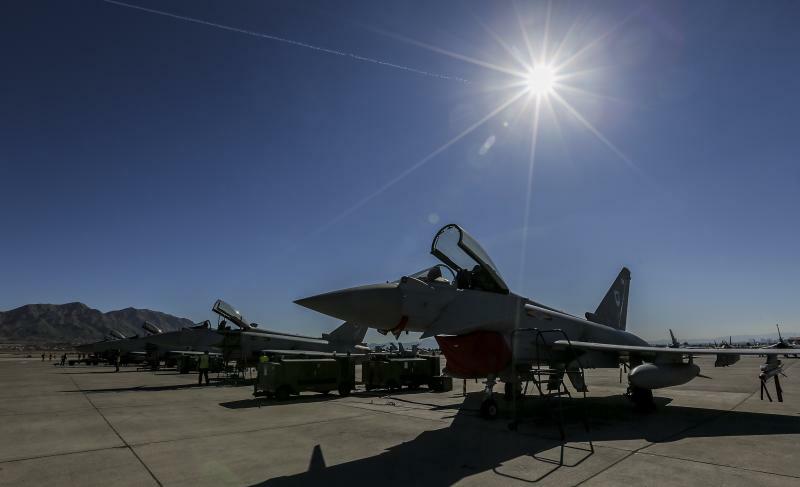 RED FLAG itself comprised of 3 weeks of high intensity Combined Air Operation (COMAO) training, split into planning and execution days. 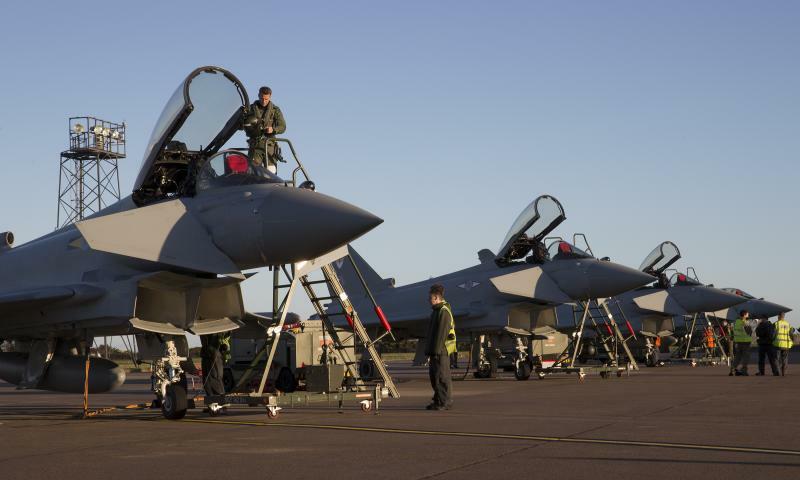 The planning days involved the brainstorming and generation of an integrated mission, with various Squadron pilots taking various key roles throughout the duration of the Exercise, including as the overall Mission Commander. 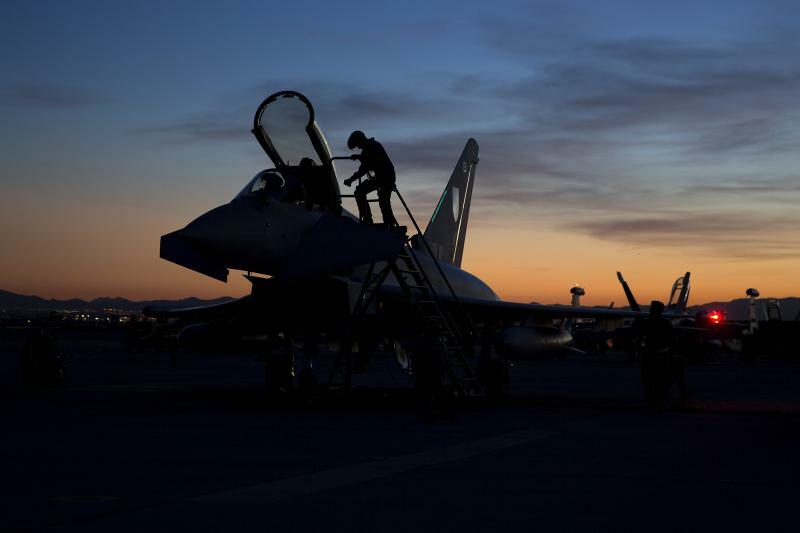 After 10 hours of deliberation, co-ordination and tactical assessment the sortie was mass-briefed and all then stood down for the evening. 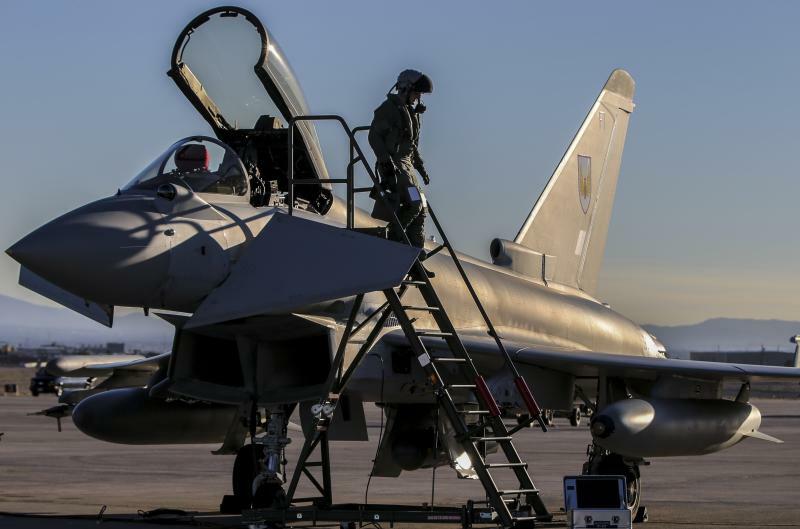 The following day the sortie was executed then thoroughly debriefed, with a real-time play back of key events and errors so that they could be highlighted and all could learn from the experience. 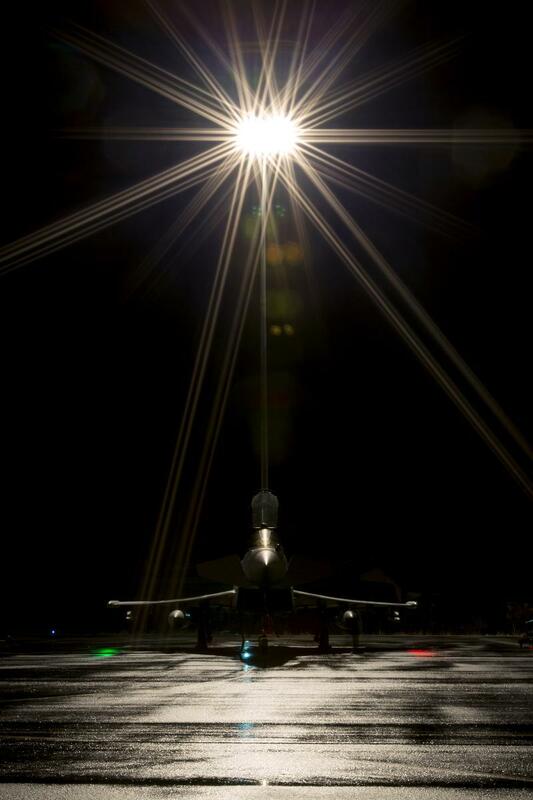 This process continued for both day and night missions, so the overall detachment was split into four teams; with personnel either planning or flying at day and night throughout the exercise period. 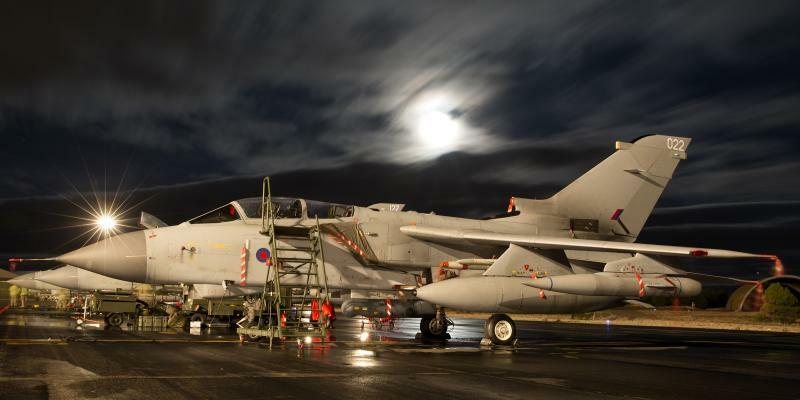 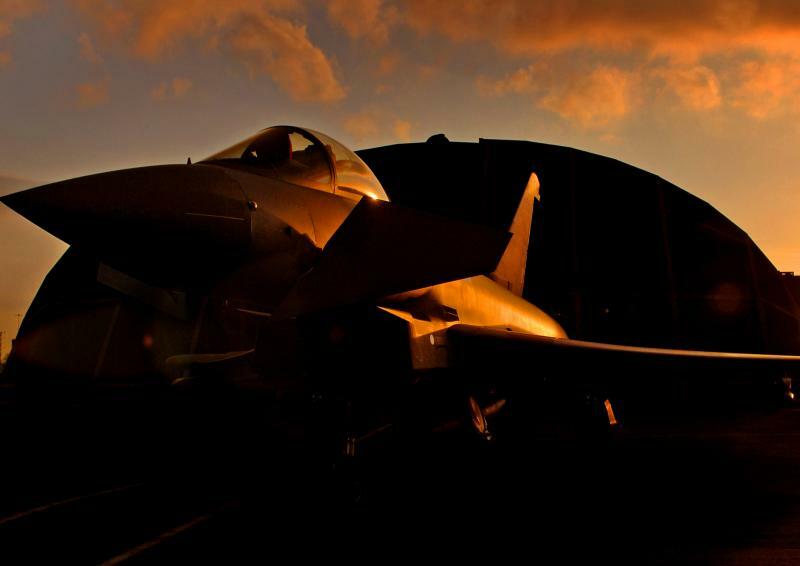 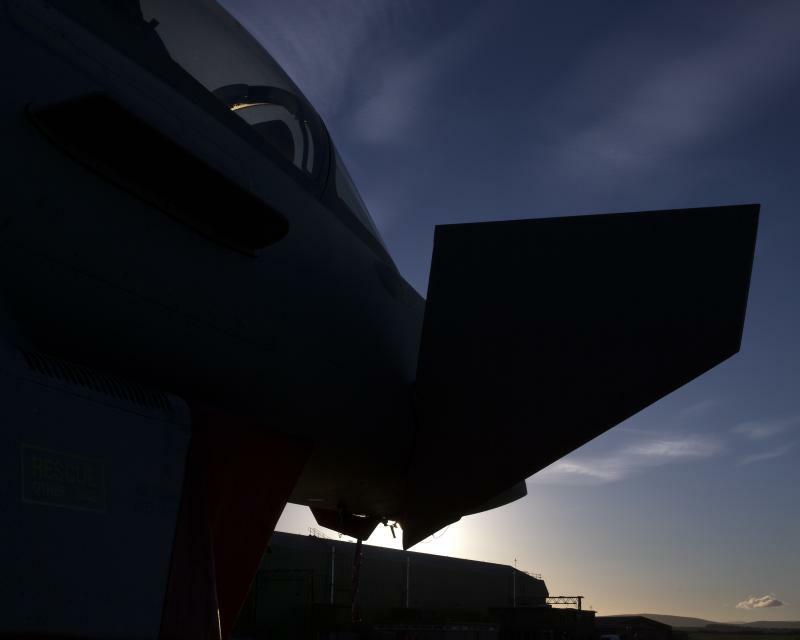 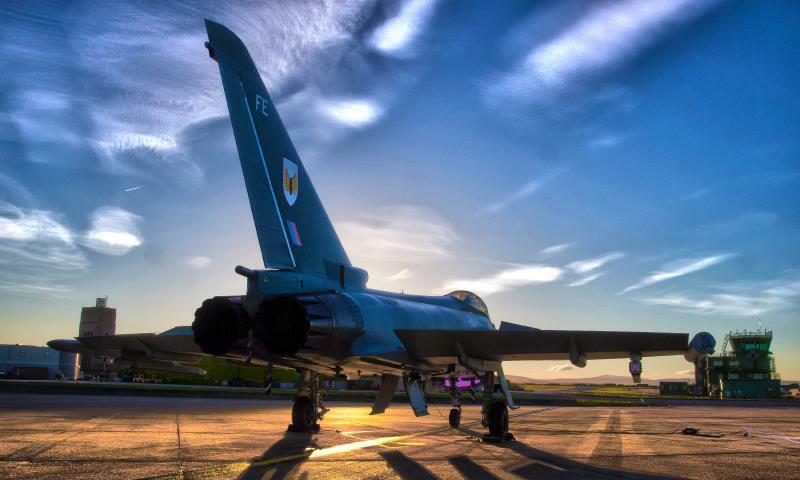 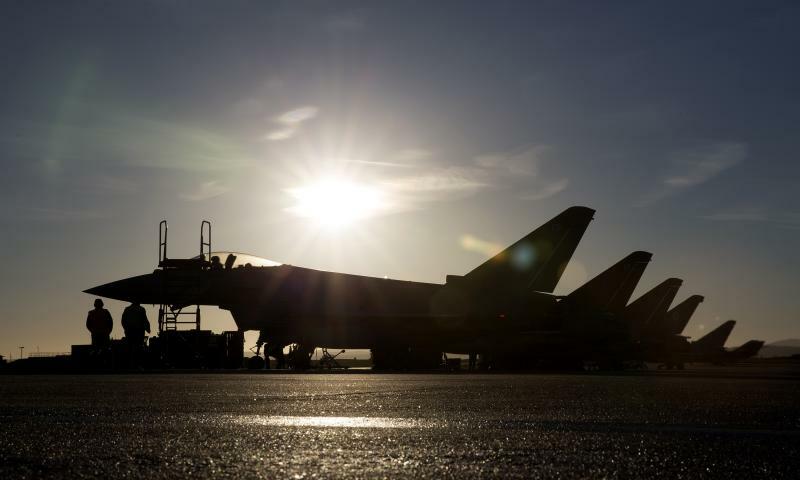 The combination of day and night flying put a considerable strain on the detachment Engineering operations, where the team did a magnificent job of maintaining serviceable aircraft, while simultaneously preparing live (HE) Paveway IV weapons on a separate line. 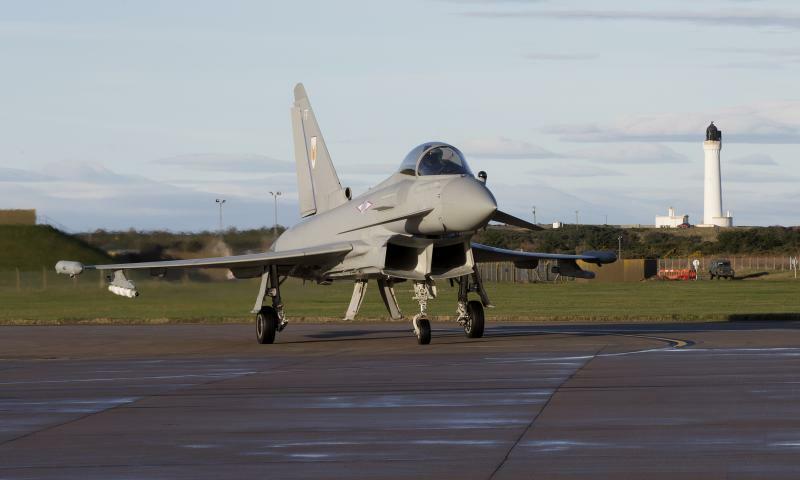 The sorties were challenging, and put the pilots, engineers and mission support staff through their paces. 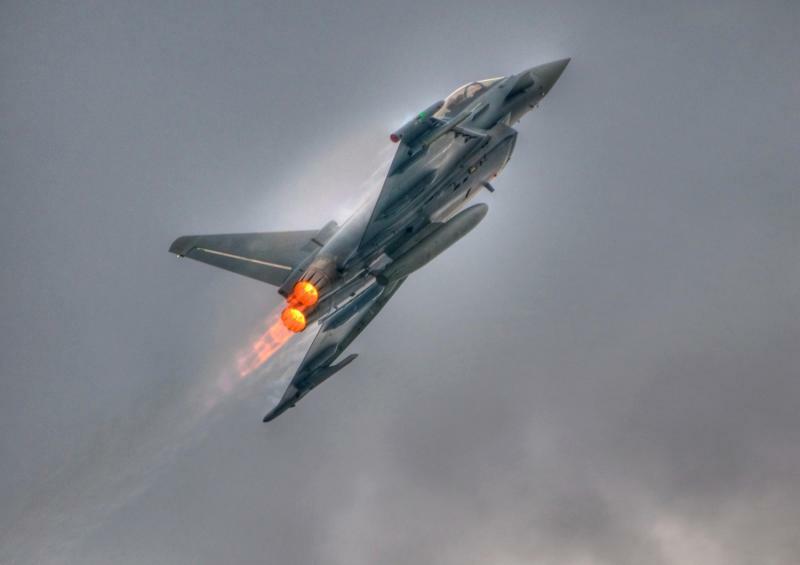 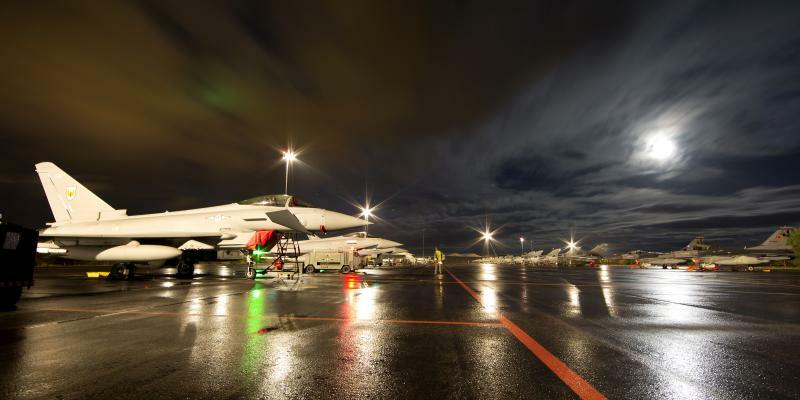 With the engineers maintaining a near 24-hour operation due to the wave timings, pilots were being exposed to an increasing level of air and surface threat that continually tested the tactical proficiency and survivability of the aircraft. 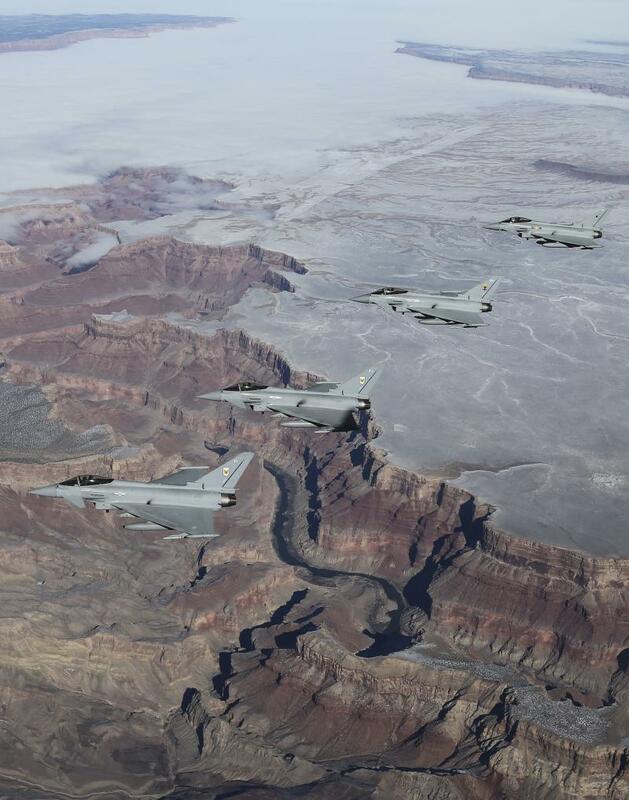 The Typhoon detachment worked closely with the low-observable F22 RAPTORs, and venerable F15C aircraft to perform both Defensive Counter Air and Offensive Counter Air Sorties, with the Typhoons often tripping the line first to ‘sweep’ and create a Favourable Air Situation for the Strike aircraft to execute their missions. 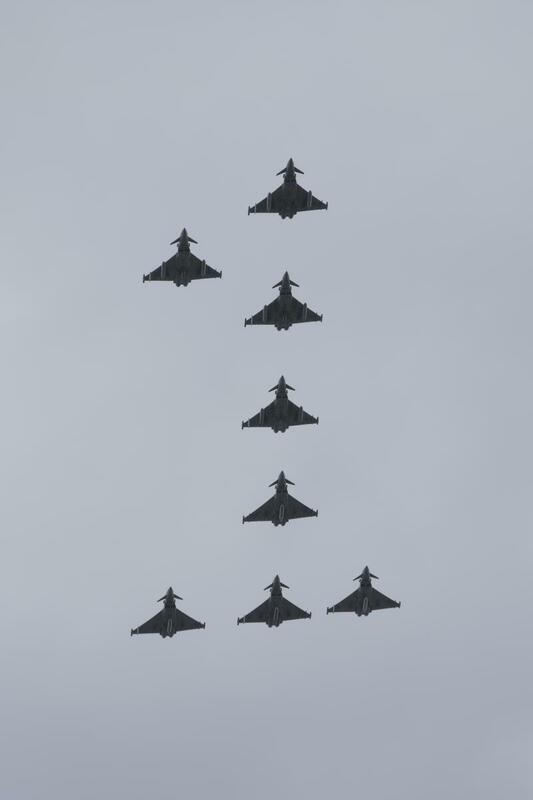 These included a variety of jets, including F16, F18 and B2. 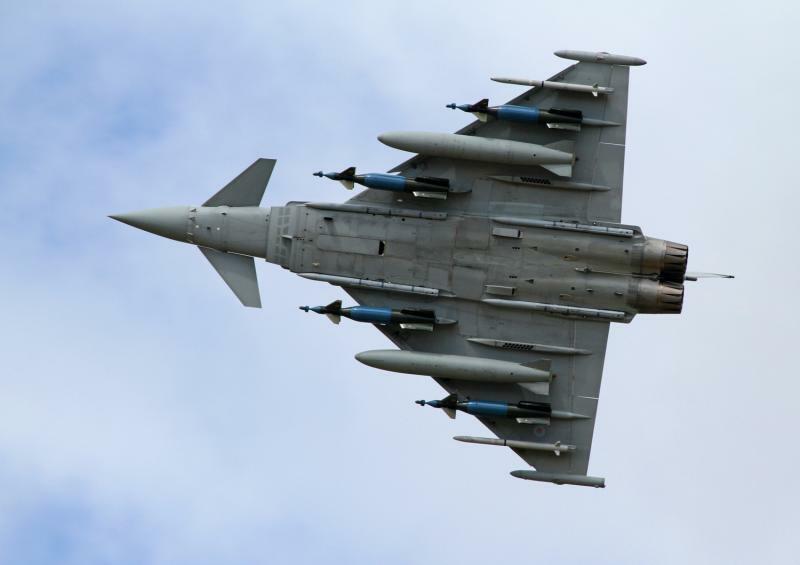 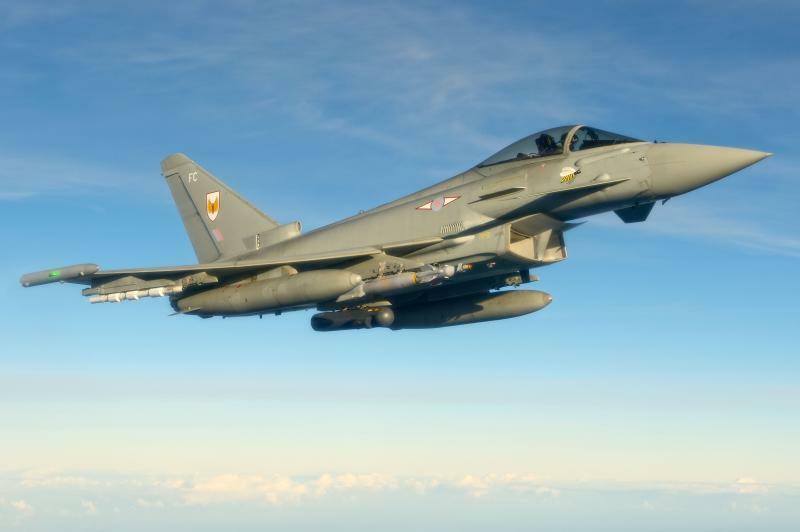 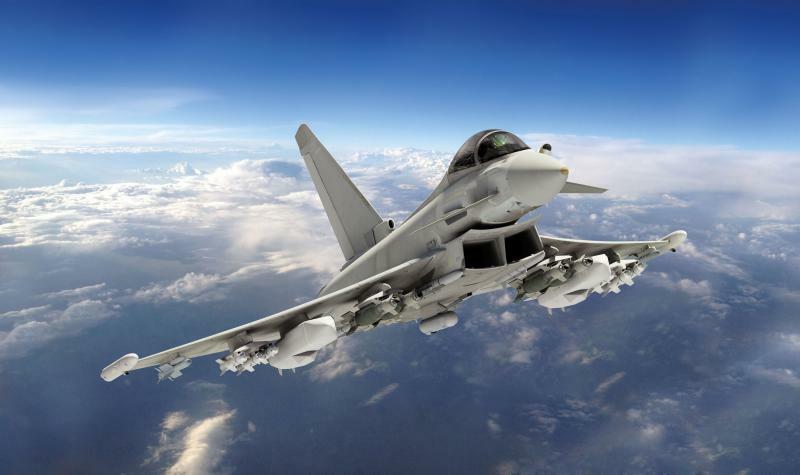 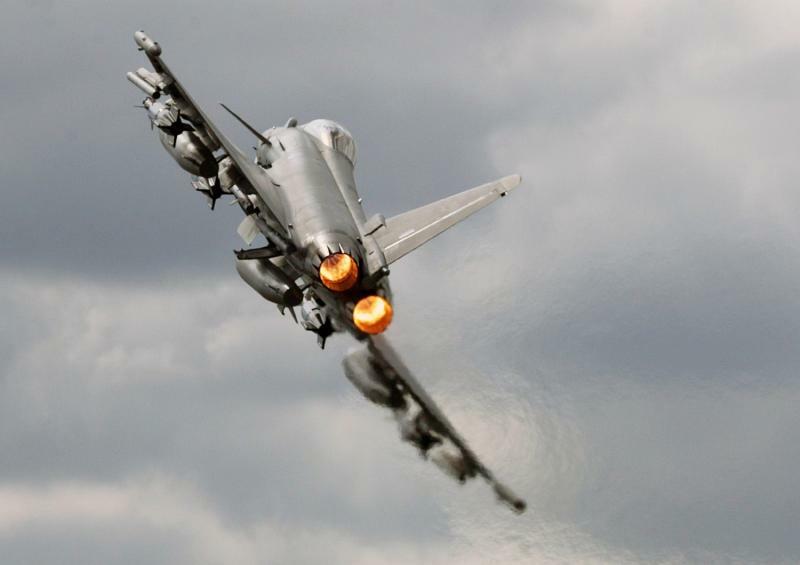 Often the Typhoons would strike targets with the Paveway IVs, and then switch to an air to air role to protect other assets as they egressed from the airspace. 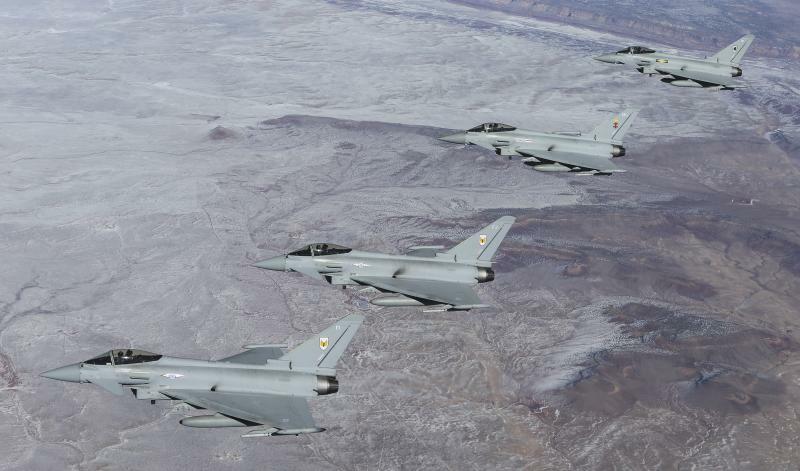 With the mix of combat aircraft, ISR and AAR platforms and UAVs, there were routinely 60-80 aircraft in the airspace. 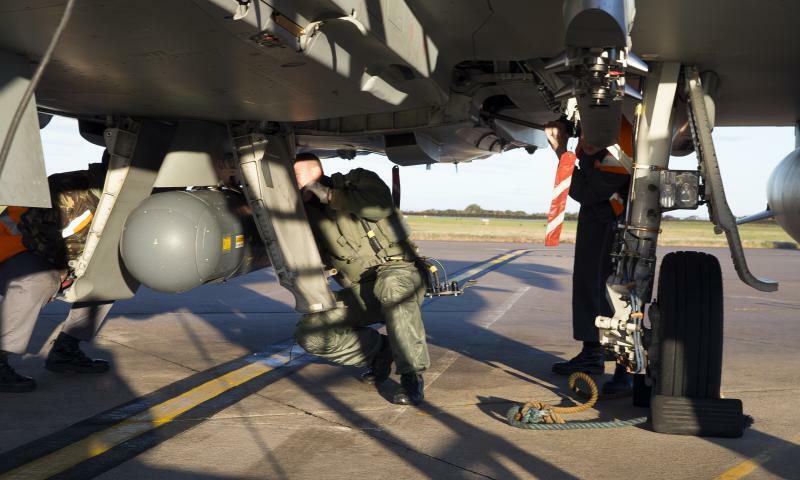 The P1Eb capability enhancement performed well – the integration of the Helmet Mounted Sighting System and Litening III designation pod enabled pilots to target threats both on the ground and in the air by simply looking at them. 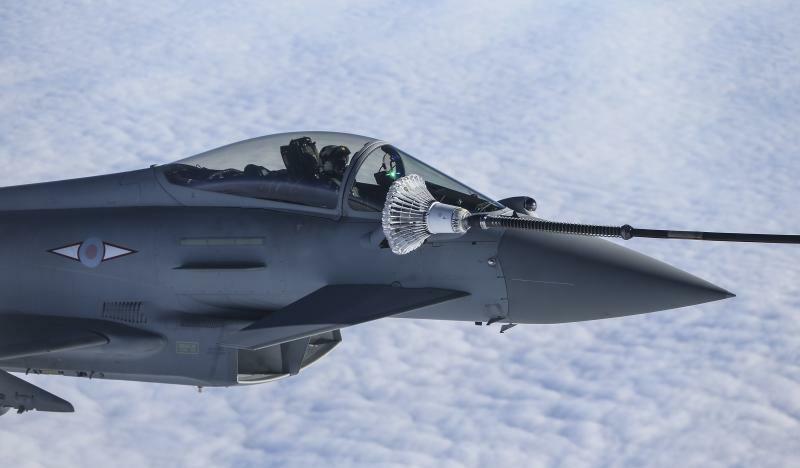 24 precision weapons were released in both GPS and laser guidance modes all striking their targets, and the detachment enjoyed an excellent aircraft serviceability rate. 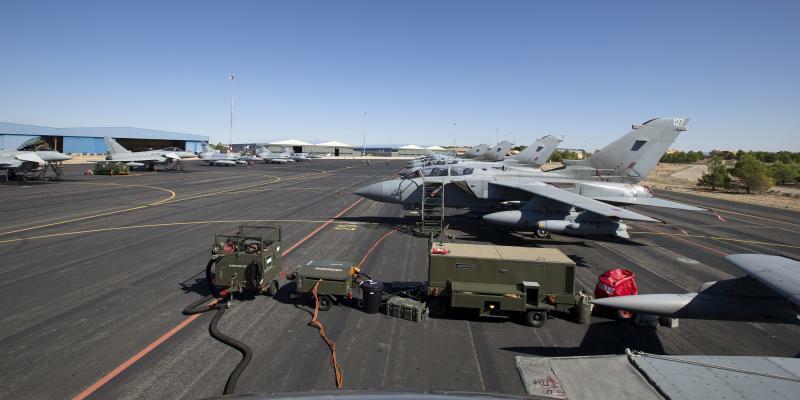 The utility and benefits of Ex RED FLAG are tangible on many levels. 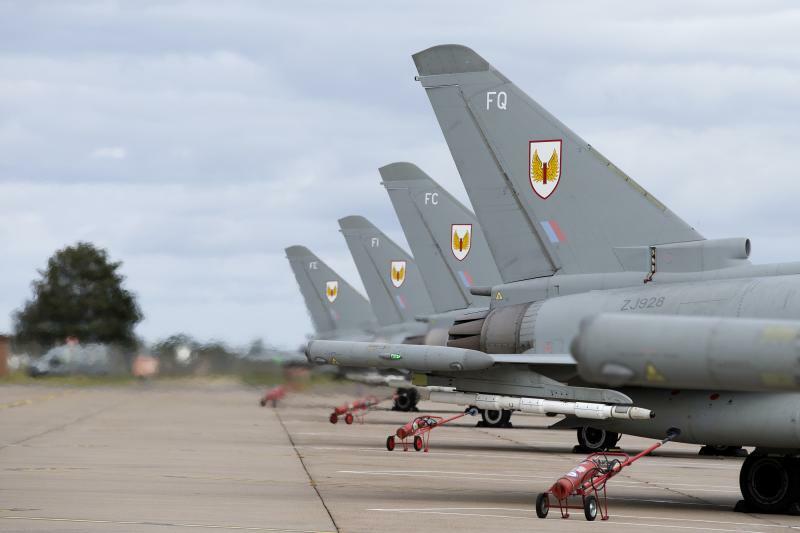 First and foremost it is an opportunity to test the Squadron in the most complex and challenging training environment in the world, and assess current tactical employment standards against those of our closest and most trusted allies. 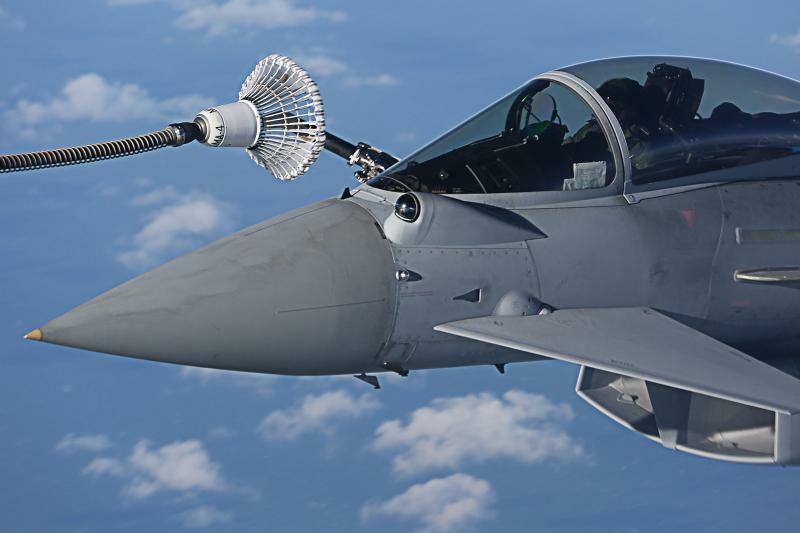 In doing so it proved the utility of the P1Eb capability upgrade, and provided a unique training opportunity for everyone involved. 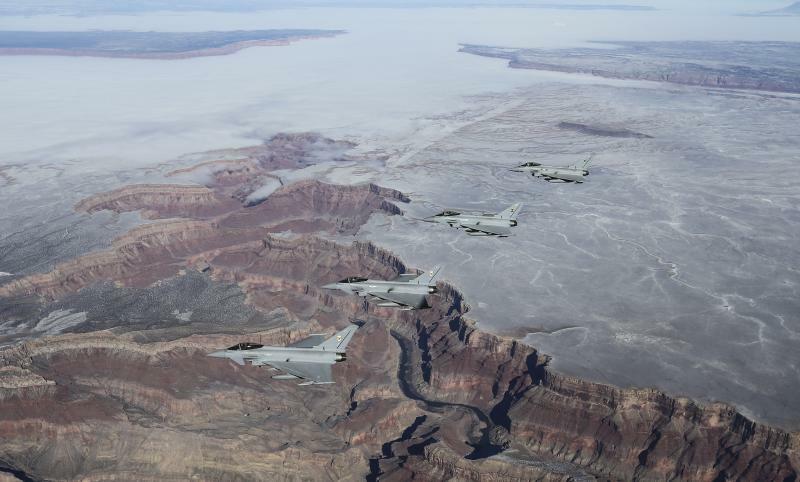 It enabled the team to integrate with the finest USAF combat platforms and update current tactical thinking and procedures, and exposed junior officers to the complexity of joint integrated combined operations. 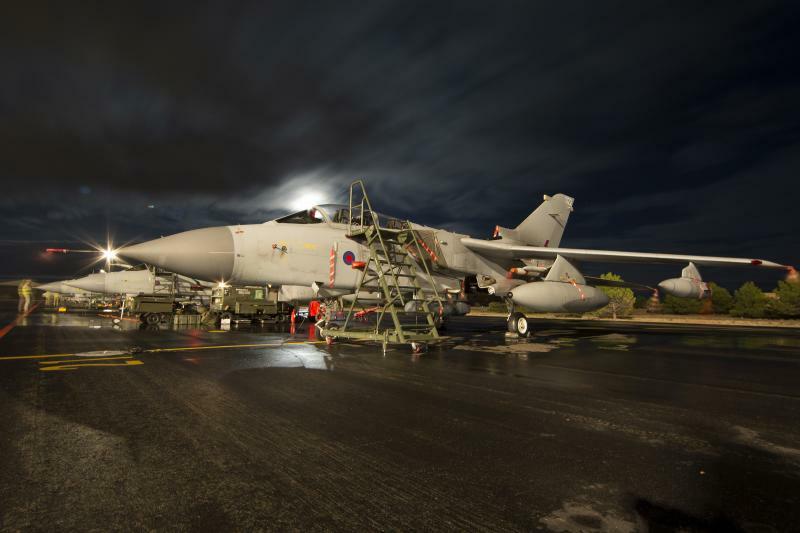 It also provided an outstanding opportunity for the team to deploy and operate together, away from a Typhoon main operating base. 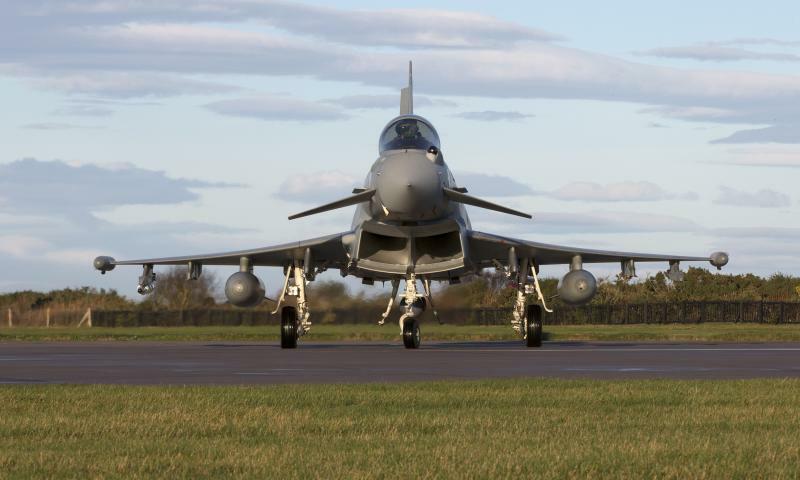 The team returned wiser, more confident and more capable on the back of what was a superb training Exercise.